Attendees kicked off the 2018 New York State Fair in Syracuse with a ribbon cutting ceremony featuring Governor Andrew M. Cuomo for the fairground’s new 136,000 sq. ft. Exposition Center, featuring a four-sided, center-hung digital scoreboard manufactured by Watchfire Signs. 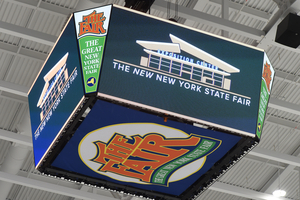 The $63 million Exposition Center at the New York State Fairgrounds is the largest indoor events space north of New York City between Boston and Cleveland. Watchfire partnered with Ridley Electric Co. Inc. of Syracuse and ABC Sign Corporation of Bridgeport, Conn. to design, manufacture and install the video display and scoreboard. Each side of the 6mm, high-resolution scoreboard features an LED display measuring 7 ft. by 13 ft. The display delivers true-to-life color and ultra-wide viewing angles for video, graphics and other content for various sports and live events. The display provides the Expo the flexibility to display one large scoreboard or a combination of graphics, videos and sponsor messages. Officials expect the Exposition Center will help bolster State Fair attendance, while also providing a flexible event space capable of hosting visitors at year-round events, including equine competitions, trade shows, concerts, and hockey and other sporting events. The new center features 110,000 sq. ft. of open floor space. Retractable risers can hold 4,000 visitors and the facility can accommodate another 5,000 concert attendees. "By boosting tourism and attracting businesses from across the country, the uniquely situated Expo Center will deliver lasting economic benefits to keep Central New York rising for generations to come,” said Governor Cuomo at the ribbon cutting ceremony.